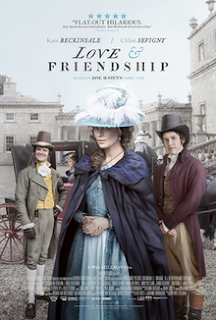 There has been much talk about the manipulativeness and seductiveness of the Jane Austen character, Lady Susan, who Kate Beckinsale portrays in Love & Friendship. As interpreted by Whit Stillman who wrote and directed the adaptation, Lady Susan is a charismatic figure whose beauty and intelligence allow her to surmount both her status as a landless widow and also the manners and mores of her time. Though she steps from the pages of an l8th century epistolary novel, her verbal acrobatics would have made her at home in Restoration comedy. In an odd way she's the kind of strong and rebellious woman you would find in Ibsen, a mixture of Hedda Gabler and the Nora of A Doll’s House. She’s both a child of Darwin and a exemplification of the Shavian “life force.” She’s a survivalist and descriptions which have framed her as an invidious creature of appetite lack and appreciation of the universe in which she operates, which is dictated by the forces of nature. She’s interested in marrying her daughter off to Sir James (Tom Bennett), a wealthy dull-wit, (who's malapropisms are inadvertently witty) while seeking out the attentions of Reginald DeCourcy (Xavier Samuel). However she’s constantly playing her cards and without giving anything away, the Lord of Misrule (in this case Susan) ends up restoring the Great Chain of Being. How to talk about morality in a world like this? Love & Friendship has its band of upright scripture quoting citizens. Yet if the "motiveful malignity" of Stillman’s antagonist hadn’t taken the film by a storm, the world would plainly be a lesser place.